The Tie Breaker is a stylish aviator design with a smaller fit. It has a streamlined teardop shape with beautiful nylon temples. They bring together world class design with the world's finest materials to product a sunglass that is comfortable, lightweight and sculptured with cutaways and inlays for a look that is full of attitude. 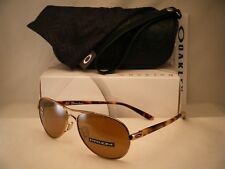 Oakley TIE BREAKER aviator's does it with style like no other. They bring together world class design with the world's finest materials to product a sunglass that is comfortable, lightweight and sculptured with cutaways and inlays for a look that is full of attitude. Model: Loreto; LR64. Costa Del Mar Sunglasses are 100% Polarized and Provide 100% UV A/B/C protection. What sets us apart is the clarity found in our lenses, they simply outperform the competition. Put on a pair of Costa lenses and you're looking through patented technologies and the highest quality materials around that create the clearest sunglass lenses on the planet. Both lenses BADLY scratched. Can be used as parts. 100% VERSACE AUTHENTIC. Lens Color: DARK GREY. Model: VE 2161. NEW COLLECTIONS. MADE IN ITALY. Included (color may vary). Carrying Case. Polarized Aviator Sunglasses. Protection: Polarized lens are laminated with tiny vertical stripes that only allow vertically angled light enter the eyes and protects eyes from harmful UV rays. Also gives a clearer view eliminating glare from surfaces. The shallow tear drop shape gives it a great fit and the acetate temples give it a great look as well as making these sunglasses very comfortable. Finally the spring storms blow out of town and you to slip on the aviator-styled Maui Jim Sea House Sunglasses. Gold/HCL Bronze 100% Authentic Maui Jim. Silicone Clearshell scratch coating ensures you don't ruin the lenses by putting them in your pocket with your cell phone. WITH BROWN GRADIENT POLARIZED LENSES. Lens Color: BROWN GRADIENT POLARIZED. Lens Type: Oakley Plutonite®. MODEL: HC7041 9176T5. STYLE: ALTON. LENS: BROWN GRADIENT, POLARIZED. AUTHENTIC COACH SUNGLASSES. 100% AUTHENTIC, GENUINE COACH PRODUCT. SIZE: 59/135 MM. ITEM MUST BE IN THE. If you want to disappear into the sunset during your escape to the beach, make sure you have the polarized Maui Jim Wiki Wiki Sunglasses before you drive into the inviting, eyeball-burning sun. Maui Evolution Single Gradient.